Payday Loan Storefronts: We've often heard claims from Nevadans that payday loan storefronts are found on more street corners than McDonald's and Starbucks. Financial literature suggests payday loan storefronts are found in lower income neighborhoods and areas with limited consumer banking options. At Innovative Research and Analysis, we sought to test these anecdotes and research findings using local data. 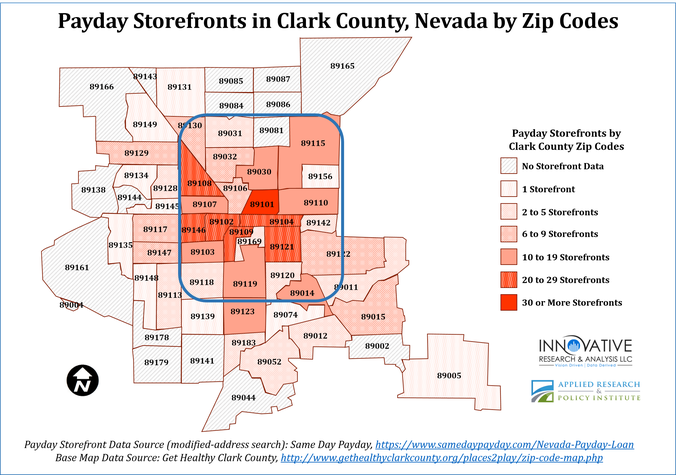 Using available payday lender, title loan, and cash advance service data from an industry source, Same Day Payday, we were able to map payday storefront densities in Clark County by Zip Codes. The area denoted by the blue box accounts for approximately 52.3% of the study area zip codes, 46.3% of study area residents, and 82.7% of payday storefronts. The zip code with the most payday storefronts is 89101, which has 10.9% (44) of the study area storefronts. Building off of the payday storefronts map, we assessed median income by zip code in the same study area. Applying the same focus area that accounts for 52.3% of study area zip codes, 46.3% of study area residents, and 82.7% of payday storefronts we can see a connection between high storefront density and lower-income areas. 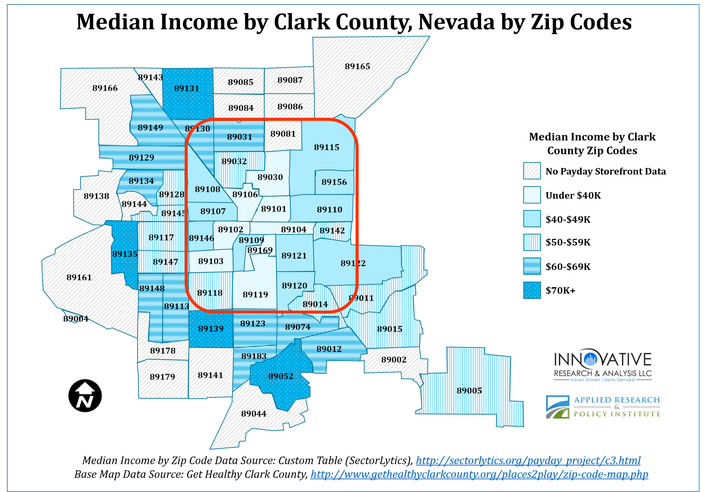 Case in point, the average median income of the focus area is $42,000 annually as compared to county-wide average of just over $52,000 annually. Additionally, the focus area contains the 8 most impoverished zip codes that account for 18.2% of the study area, an average median income of less than $40,000 annually and 35.8% of payday storefronts. Zip code 89101 has the most payday storefronts at 44 (10.9%) of payday storefronts and the lowest median income at $22,000 annually. One of the related findings with payday lending usage is related to credit and bank access. 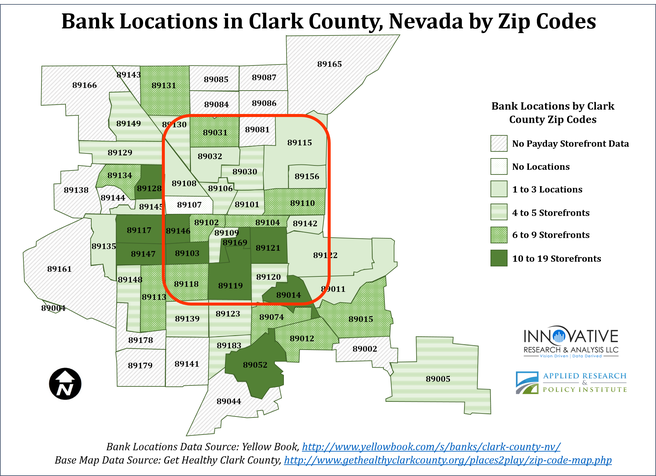 Continuing our assessment of payday lending in Nevada, we collected bank location data from yellowbook.com to determine the availability of banks comparatively. Conversely to payday storefront findings, bank locations are commonly found more evenly dispersed across the study area. From the focus area perspective 52.9% of study area bank locations are found within the same area that has 52.3% of study area zip codes, 46.3% of study area residents, an average median income of $42,000, and 82.7% of payday storefronts. Throughout our assessment of payday lending in Nevada, we recurrently heard anecdotal reports comparing payday storefronts to other prevalent business such as Starbucks and McDonald's, which seem to pop-up on every other street corner. Comparatively, there are 176 Starbucks stores in the study area that contains 405 payday storefronts. The zip code with highest density of Starbucks is 89169 with 35 stores, which is more commonly known as the Las Vegas Strip. Considering the millions of visitors to the Las Vegas Strip annually and in-casino Starbucks, this high concentration is expected from a target market perspective. 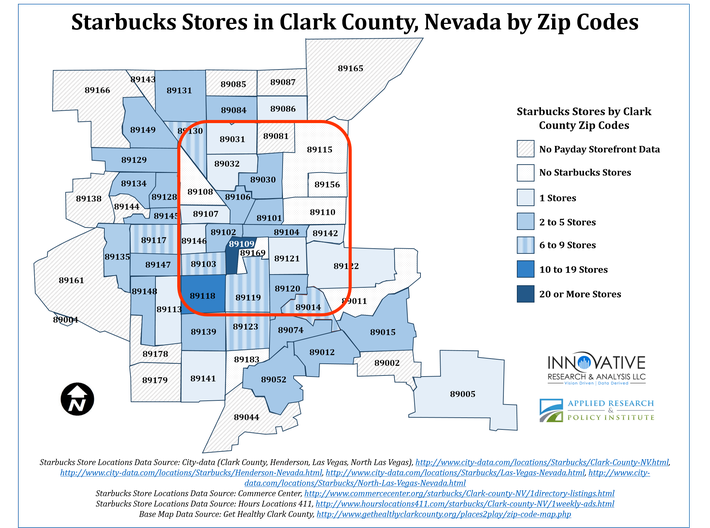 Further exploring this target market perspective for payday storefronts, let's consider that zip code 89101, which has 44 or 10.9% of payday storefronts compared to the 35 Starbucks on the Las Vegas Strip, which accounts for 19.9% of study area stores. These findings indicate a similar target market relationship between payday storefronts and target customers, who commonly have household incomes of less than $40,000 annually.